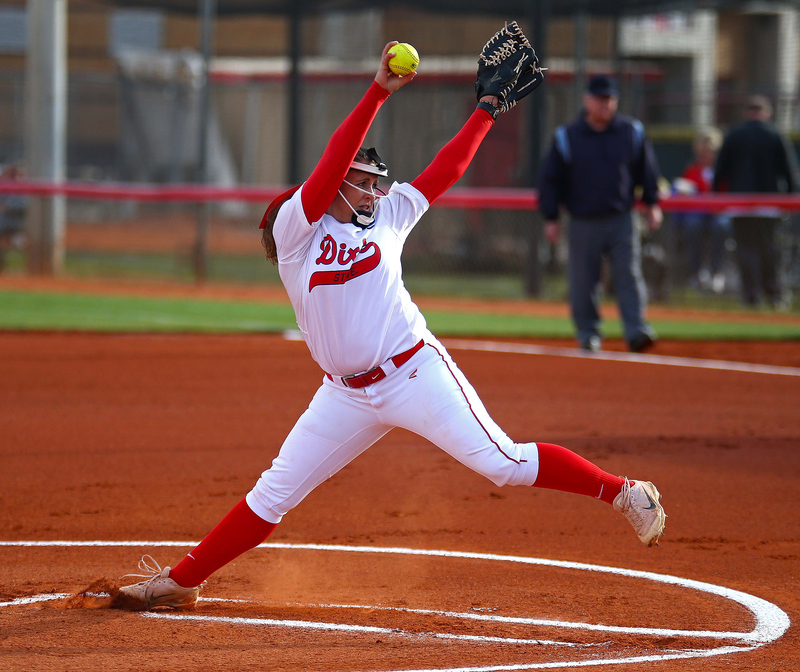 ST. GEORGE – The Dixie State softball team swept visiting Azusa Pacific in two very different ball games Saturday at Karl Brooks Field. In game one, the Trailblazers scored nine runs in the first inning en route to a mercy-rule finish, 11-2. In game two, Bailey Gaffin hit a walk-off double to score the winning run in the bottom of the seventh inning, 4-3. “In the first game APU’s coach was trying to get one of their lesser-experienced pitchers some innings,” said Dixie State head coach Randy Simkins. The Trailblazers were nearly through their lineup before the pitcher was replaced in the first inning. But even with the pitching change, the momentum continued as DSU got four more hits and a walk to get to nine runs. In all, the Blazers had seven players hit safely and three more batters walk. Another base runner reached on a throwing error. The Blazers put up two more in the second inning. That proved to be sufficient enough to end the game in the fifth as the Cougars could only plate two runs the rest of the game. Gaffin led the team with two hits. Arista Honey led the team with three RBIs. Dani Bartholf and Jessica Gonzalez had two RBIs apiece. Barkwell pitched the complete game (5 innings), allowing two runs on five hits. The second game was more difficult for DSU to find hits. Through the first three innings, the Trailblazers only got one hit. Down 1-0, the Trailblazers finally broke through in the fourth. Brenna Hinck started the inning with a double to left center. Josey Hartman then sacrifice-bunted her to third. Janessa Bassett then drew a walk. Bartholf then hit a double to score both runners. Bartholf then advanced to third and then home on two separate wild pitches. Dixie State led 3-1. The Cougars responded by scoring a run in the fifth and the tying run in the top of the seventh. Barkwell was called on to relieve Brooklyn Beardshear in the top of the seventh. She entered the game with no outs and runners on the corners. In the seventh, it looked as though the game would go extra innings as the first two batters were retired in order. Kenzie Sawyer broke that trend with a walk. Simkins called on Taylor Godfrey to pinch run. The steal proved big as two pitches later Gaffin hit a 1-2 pitch to left center field. It was a stand up double for Gaffin, but more importantly, scored the winning run. Gaffin was again the only multi-hit player, going 4 for 6 on the day. Bartholf led the team with two RBIs. Barkwell got her second win of the day from the circle and stands now at 7-1. The sweep moves Dixie State to 30-8 overall and 15-5 in the PacWest. APU falls to 12-6 in conference play and 20-11 overall. The Trailblazers will now play Division I UNLV in a non-conference matchup on Wednesday night in Las Vegas. They will resume conference play at home with a doubleheader against Notre Dame de Namur on Apr. 8.